We understand that the privacy of our users is extremely important. We do not sell, trade, or otherwise transfer any personally identifiable information collected on this website to outside parties. 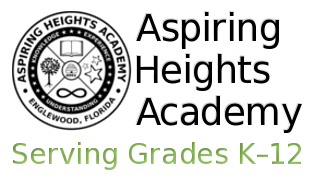 Like most websites, aspiringheightsacademy.com makes use of access log files. The information inside the access log files includes Internet protocol (IP) addresses, type of browser, Internet Service Provider (ISP), date/time stamp, referring/exit pages, and number of clicks to analyze trends, administer the site, track user’s movement around the site, and gather demographic information. IP addresses and other such information are not linked to any information that is personally identifiable. If you prefer, you can choose to have your computer warn you each time a cookie is being sent, or you can choose to disable all cookies via your browser settings. The help section and the websites of most browsers provides instructions on blocking or disabling cookies. If you turn your cookies off, some of our services may not function properly. To process transactions. Your information, whether public or private, will not be sold, exchanged, transferred, or given to any other company for any reason whatsoever without your consent, other than for the express purpose of delivering the purchased product or service requested. To send periodic emails. The email address you provide for order or service processing will only be used to send you information and updates pertaining to your order or service. We do not sell, trade, or otherwise transfer any personally identifiable information collected on this website to outside parties. We may release your information when we believe release is appropriate to comply with the law, enforce our site policies, or protect ours or others rights, property, or safety. Last updated on 25 June 2018 .